Caleb Edney Lewis was born in Chard in 1882, the son of miller James Henry Newis (1860-1914) and Mary Anne née Lucas (b 1858). By the time of the 1891 census James and Mary had moved to Trent Corn Mills, just east of Yeovil, where James described his occupation as Miller (Master). They were living at the mill with their three children Caleb, Lily and Albert, aged 8, 6 and 4 respectively. By 1901 James and Mary, together with their children and Mary's father, were living at The Knoll, Preston Road, with solicitor Athelstan Rendall. James gave his occupation as grain merchant while Caleb, now aged 18, was a printer's assistant. In 1909, at the age of 27, he married Ellen Maud Pitman Smith at Chard. They were to have two children. Caleb served in the Cyclist Section of F Company, 2nd Volunteer Battalion, Somerset Light Infantry, and later served in D Squadron, West Somerset Yeomanry. After his volunteer service he was a member of the Yeovil Company of the National Reserve. His military service probably accounts for the fact that in the 1911 census Ellen was living with her father and brothers on the family farm at North Perrott. Nevertheless, Caleb and Ellen lived at 'Iva', Preston Road with his mother Mary after the death of his father in 1914. Since Caleb was a member of the Yeovil Company of the National Reserve, he enlisted at Yeovil on the outbreak of war, joining the 6th Battalion, Somerset Light Infantry (Service No 3/7442). In fact he may, indeed, be one of the men in the first photograph below of the Yeovil Company of the National Reserve in the Borough, taken the day war was declared. On 26th August the 6th Battalion moved forward again to reserve trenches 300 yards in front of Bernafay Wood. Relief, however, came on 30 August, the 6th Somersets returning first to temporarily billets in Fricourt and then to a rest camp. On 31 August the Battalion entrained at Mericourt for Selincourt, 20 miles west of Amiens where, until 12 September, all ranks enjoyed a complete rest. Unfortunately almost as soon as the Battalion returned to the trenches Caleb was killed in action on 16 September 1916. He was aged 34. The Western Gazette reported in its 13 August 1915 edition "An intimation was received on Saturday morning that Private CE Newis, of the 6th Somersets had been wounded and taken to a base hospital. An old Volunteer and Yeoman, Private Newis of Preston Road, joined the 6th Somersets at the outbreak of war with other members of the Yeovil Company of the National Reserve." On 29 September 1916 the Western Gazette reported "Information has been conveyed to the relatives of Lance Corporal CE Newis, of Preston Road, from a friend of his serving in the Somersets at the Front, that he has been missing since an attack a week or so ago. The writer adds, that he and his friends had great hopes that Corporal Newis had been wounded and had been taken down the line somewhere where he was unable to write." The Western Gazette reported on 20 October 1916 "Official intimation has been received by the relatives of Lance Corporal CE Newis, of Preston Road, that he has been missing since an attack on September 16th. The letter also received from the adjutant of his Battalion, after enquiries made amongst the men of his platoon, says that he can give no further information than that contained in the official notification." The following week, on 27 October 1916, the Western Gazette wrote "The Union Jack was hung on the pulpit at the Vicarage Street Wesleyan Church on Sunday in memory of the late Corporal CE Newis of the Somerset Light Infantry. Special reference was made by the Rev. WMJ Noble, to Corporal Newis’s death, he being a member of the congregation, and had passed through all the classes of the Sunday School. Sympathy was also expressed with the relatives." Finally, on 3 November 1916, the Western Gazette reported "Notification was received on Monday morning that Lance Corporal CE Newis, elder son of the late Mr JH Newis and Mrs Newis of Preston Road, was killed in action on September 16th. Lance Corporal Newis, who formerly served in the cyclist section of the old F Company, 2nd VB, Somerset LI, and afterwards in D Squadron, West Somerset Yeomanry, was a member of the Yeovil Company of the National Reserve, which at the outbreak of war joined a service Battalion of the Somerset Light Infantry, which has made a lasting name for itself during the war, and which will always be remembered with pride in Yeovil owing to the number of well-known men from the borough and district who have bled and died in its ranks. Corporal Newis was in partnership with his brother in the business of corn merchants and millers, carried on for many years by their father, when he left soon after the outbreak of war to commence the service of King and country which has now gloriously terminated with his life. He was 34 years of age, and leaves a widow and two young children, with whom the utmost sympathy has been expressed." 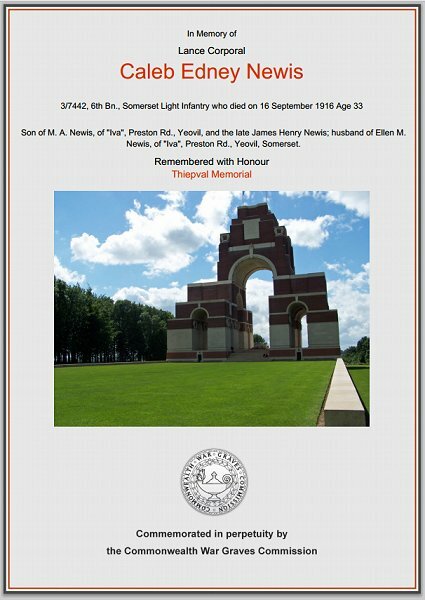 Caleb Newis is commemorated on Pier and Face 2A of the Thiepval Memorial, and his name is recorded on the War Memorial in the Borough. 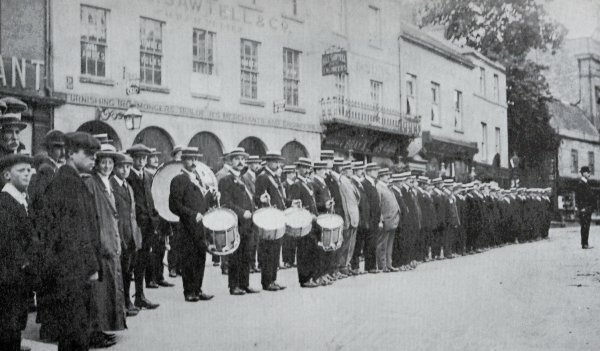 On Bank Holiday Monday, 4 August 1914, Yeovil men of the National Reservists line up in the Borough before marching to the Town Railway Station and travelling to Taunton. War was declared at midnight. As a member of the Yeovil Company of the National Reserve, Caleb is almost certainly in this photograph. The Commonwealth War Graves Commission certificate in memory of Caleb Newis.